← Join FRIENDS for our Spring Events! Posted on May 4, 2016 by FRIENDS | Comments Off on A Celebration of all things Yorkville! 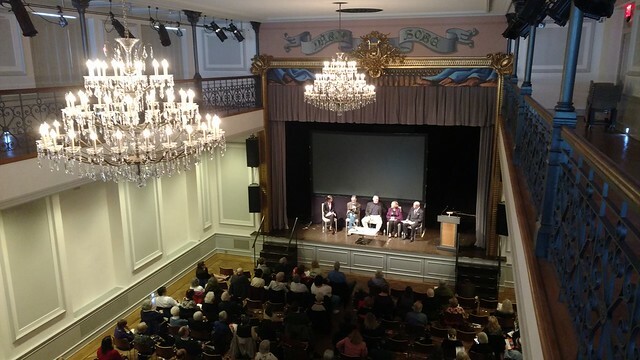 On Saturday, April 30th, FRIENDS and the Historic Districts Council hosted “Yorkville: A Celebration of Home” at the lovely Bohemian National Hall, an individual New York City landmark. Held in the Hall’s stunning Grand Ballroom, Majda Kallab Whitaker of the Bohemian Benevolent & Literary Association provided a fascinating overview of the Hall’s history and careful restoration. The event was made possible in part by the New York City Department of Cultural Affairs in partnership with City Council Member Ben Kallos. This year, Yorkville was selected as one of the Historic District Council’s “Six to Celebrate” neighborhoods, and the event celebrated the melting pot of German, Czechoslovakian, Hungarian, Irish, and other immigrants who have shaped Yorkville into the vibrant neighborhood it is today. Over 125 friends from near and far gathered to listen, learn, and lunch! The symposium featured an oral history panel, moderated by Alexandra Kelly of the New York Public Library, with panelists Thomas Pryor, Peter Walsh, Irene Mergl, and Edward Kasinec. Our wonderful panelists shared colorful stories of growing up in Yorkville and what makes the neighborhood special to them. The NYPL is currently conducting a series of oral history interviews as part of their Upper East Side Community Oral History Project, and the panel was recorded as part of this initiative. Other highlights included a demonstration by Vít Hořejš of the Czechoslovak-American Marionette Theatre, where he showcased his 200 year old puppets that he discovered in the attic of Jan Hus Presbyterian Church on 74th Street. The final presentation was an architectural discussion by Gregory Dietrich of Gregory Dietrich Preservation Consulting and Elizabeth Fagan, Director of Preservation at FRIENDS. The talk highlighted some of Yorkville’s treasured buildings, including the wooden house at 412 East 85th Street. The wonderful afternoon concluded with a lunch sampling of some of Yorkville’s ethnic culinary traditions, including food from Schaller & Weber, Glaser’s Bake Shop, Grünauer Bistro, Patsy’s Pizzeria, and more! Thanks to all who were involved and helped to make this event so special!